Given the costs and construction logistics, a podium deck project can be intimidating. With the right team and a strategic approach, however, work on this critical asset can yield lasting benefits. How do you determine when a podium deck needs work? Check your calendar. Typical deck lifespans run 25 to 30 years, after which waterproofing systems can begin to fail. Leakages through slab crack locations can also be a telltale sign but are just one of the less visible indicators. 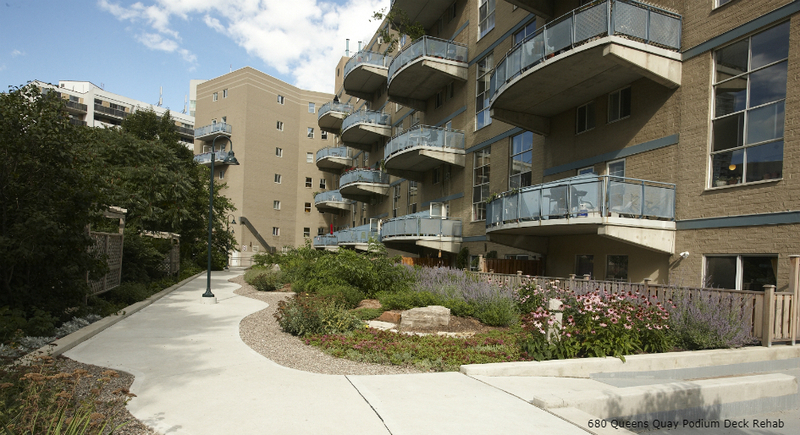 For a full view of a podium deck’s health, consider a condition survey assessment. These are useful in looking beneath a property’s hard and soft landscaping features to assess the true state of a podium deck and its working parts. They are also critical in determining how effective the waterproofing system is at keeping water and salts out of the structure and, therefore, preventing deterioration. 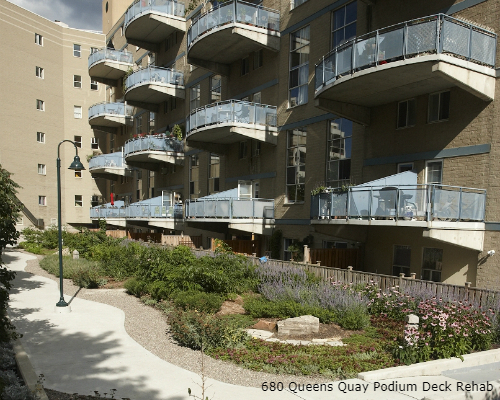 Podium deck issues can pose significant risks if left unchecked. Not only can the deterioration of the slab soffit result in falling concrete, but unaddressed damages can add up to more costly repairs in the future. In short: it’s important to take action. Depending on the age of the waterproofing system, it might be possible to conduct localized repairs. This entails digging into specific areas, unearthing the existing membrane, and patching it at the known leak locations. If the system is older, though, it might be time for a full replacement. Fortunately, a full podium deck rehabilitation/replacement doesn’t have to be stressful. Instead, these projects present an opportunity for condo owners to reshape their landscape by adding new amenities or enhancing existing features. They are also an opportune time to make changes to meet “barrier-free” building requirements in applicable regions. It’s important that all parties are involved in planning these designs. 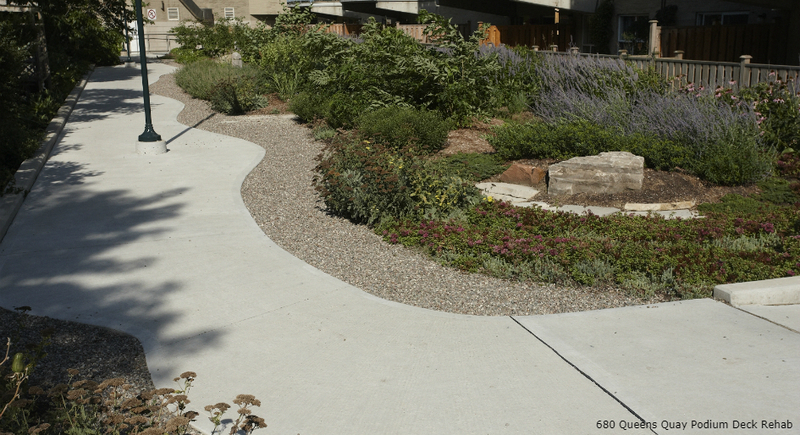 That includes consultants like RJC who can map out needed work, condo owners who can communicate their visions for the space, and contractors who can work with landscapers to make those landscaping features a reality. Jeremy Horst is a Principal with RJC Engineers. Learn more at www.rjc.ca.